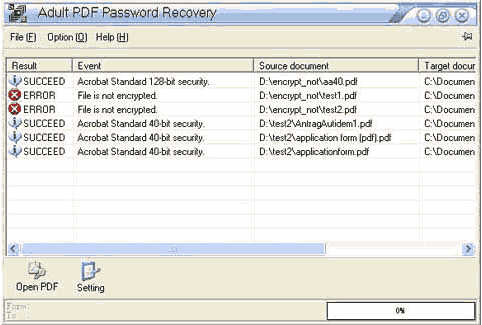 Adult PDF Password Recovery ( pdf decrypt )( passwrod remover ) can be used to decrypt protected Adobe Acrobat PDF files, which have "owner" password set, preventing the file from editing (changing), printing, selecting text and graphics and copying them into the Clipboard, or adding ,changing annotations and form fields.Decryption is being done instantly. Decrypted file can be opened in any PDF viewer ( e.g. Adobe Acrobat Reader ) without any restrictions -- i.e. with edit , copy , print functions enabled. All versions of Adobe Acrobat (including 5.x, which features 128-bit encryption) are supported. The standard security provided by PDF consists of two different methods and two different passwords. A PDF document may be protected by password for opening ('user' password) and the document may also specify operations that should be restricted even when the document is decrypted: printing; copying text and graphics out of the document; modifying the document;and adding or modifying text notes and AcroForm fields (using 'owner' password). Supports PDF1.5 protocol (formerly only supported by Acrobat 6.0). Supports windows 98, ME, NT, 2000, XP and 2003. Set the document title, subject, author, keywords to the decrypted PDF file(s).